Photo by Peter Cooperdock Order prints of selected PBP photos. 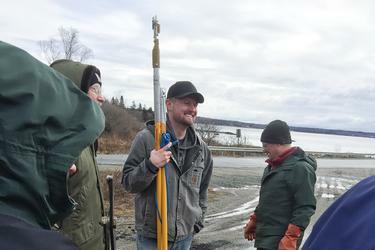 On an overcast and windy morning in late March, a hardy group of people gathered at Deer Isle’s Bowcat Preserve to learn about an invasive moth that is currently expanding its range. 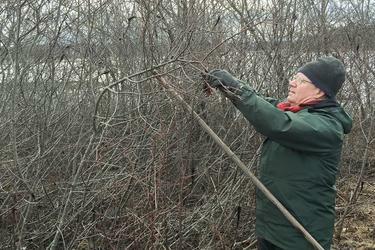 Armed with a wide assortment of clippers, loppers, shears, and pole pruners, hands covered with heavy gloves, the assembled listened to Tom Schmeelk, an entomologist with the Maine Forest Service describe the history of the browntail moth from its accidental arrival in Massachusetts in 1897 to the present day. A native of Europe, Euproctic chrysorrhea has had multiple outbreaks with varying intensities since its introduction. The species was first found in Maine in 1904 and its largest expanse covered most of New England and the Maritimes in 1914. A massive effort was organized to eliminate the nests, which overwinter the young caterpillars and introduce chemical and biological controls. Thousands of trees were cut down. That infestation ended in the early 1920s due to a combination of unfavorable weather and fungal controls. Since then, most outbreaks have occurred along the southern coast of Maine and Cape Cod. The workshop, intended to educate the public about proper timing for browntail moth nest removal, was organized by the Evergreen Garden Club of Deer Isle in cooperation with the island towns, Island Heritage Trust, Blue Hill Heritage Trust, and the Hancock County Chapter of the Maine Woodlands Association. Schmeelk explained the recent dry summers have likely reduced the growth of the controlling fungal population. This appears to have contributed to the rapid expansion of the browntail moth. The current infestation in Maine is centered around the Kennebec River Valley with various degrees of damage found in New Hampshire to north of Bangor and east to Mount Desert Island. Deer Isle has been ranked as having a moderate impact. When looking at the tree tops at the Bowcat Preserve, moderate seems be an underestimation. A nest from a nearby branch was cut and opened up, with heavy gloves, by Schmeelk for all to see the tiny caterpillars inside. Schmeelk explained the defoliation caused by the voracious appetites of these small creatures, which go through four-to-five molts until they pupate in June, is minor compared to the allergic reaction caused by their toxic hairs. The end of each tiny hair contains a chemical which can cause a skin rash similar to Poison Ivy. After each molt, when the caterpillar sheds its skin so it can grow larger, as lobsters do, the hairs can detach from the discarded skin and float through the air. If the hairs are breathed in, respiratory challenges may occur. The hairs can remain toxic for up to three years, so controlling an infestation around a house has direct benefit to the inhabitants. Schmeelk pointed out that the moth, which emerges from its cocoon in July and August, lays eggs that hatch into the first caterpillars. 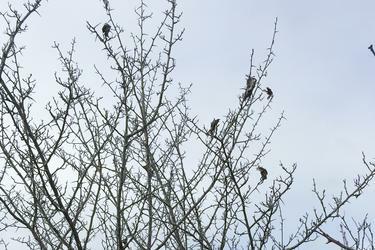 These tiny creatures begin making two-to-five inch webs to overwinter at the ends of branches. 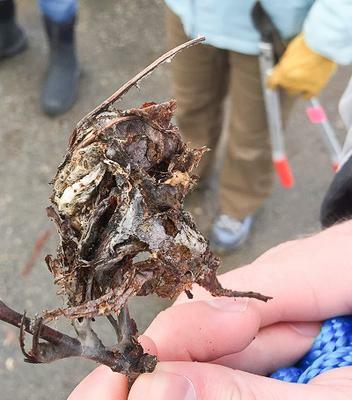 The nests differ from the Eastern tent caterpillar, which makes webs in spring and within the crotch of tree branches, and fall web worm which have much larger webs, covering several branches. The browntail moth nests can hold from 40-400 caterpillars that are about 1/8 inch long. The silk webbing used makes the nest waterproof and weather tight. The caterpillars are not affected by cold. By April, as new growth appears on the tree, the browntail moth caterpillars leave the nest and begin defoliating the tree. Winter and early spring are the perfect time to eliminate as many nests as possible. While total elimination is impossible, especially through mechanical means such as demonstrated at the workshop, an effective dent can be made in the population around the home to reduce the threat of allergic reactions. Inspired by the urgency of the situation apparent at the Bowcat Preserve, and interested in experiencing the techniques suitable to the task, the gathering entered the woods with tools at the ready. As it was a windy day, no burning, the most effective disposal method, was allowed. 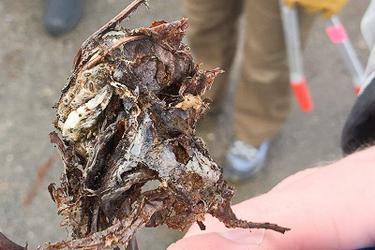 The tip of branches with nests were cut and collected in bags and barrels to eventually be covered with soapy water which dissolves the webs and drowns the caterpillars. The higher branches required team work to pull the branch down with a hook so another can cut the nest. Pole pruners were also used to snip the higher nests while a partner scurried to recover the nest as it hits the ground. A severed nest left behind would allow the caterpillars to crawl out and still find suitable food. An enthusiastic participant put it best, “You were a browntail moth; now you’re trash,” as she deposited another cutting into her bucket. Si Balch, Maine Woodland Owners, pulls a branch to cut the nest of a Browntail Moth at Deer Isle’s Bowcat Preserve on March 23. Tom Schmeelk addresses the crowd at Deer Isle’s Bowcat Preserve on March 23 where participants learned about the invasive Browntail Moth that is currently expanding its range. A Browntail Moth nests invade a Hawthorne Bush at Deer Isle’s Bowcat Preserve on March 23.